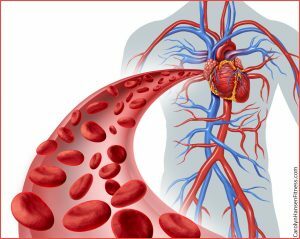 The bloodstream or cardiovascular system that circulates throughout our bodies is a transport system for delivering oxygen, nutrients, hormones and other important elements to our cells, our skin, vital organs and brains. It plays a vital role in our overall health and anyone who suffers with poor blood circulation will have difficulty performing athletically, yet performing athletically (movement) is exactly what is needed to get circulation moving again. Lack of proper exercise and nutritionally poor diets (those containing Trans fats, too much alcohol and/or sugar intake) are two major contributors to poor blood flow/poor circulation. Simple things like sitting too long in one stretch leads to poor blood circulation and anyone who has had to work a computer for hours on end can attest to that fact. Unfortunately these numbers are climbing with technology feeding our brains but robbing our bodies. You could think of the bodies circulatory system as a system of rivers and its tributaries. When water is flowing freely through a river and its offspring (tributaries etc.) the eco system and all around is healthy and flourishing. Your veins and arteries are those rivers and their offspring is a diverse system of blood circulation through different types of “vessels.” If you don’t keep the blood circulating throughout these systems, if any area is denied “blood” things stagnate, dry up and die just like a rivers tributaries would if denied their life-force of water. Studies have shown that cardiovascular disease is twice as likely to occur in those who are sedentary than those who that lead active lifestyles. You “gotta” get your blood flowing! Healthy blood flow is what increases oxygen to all your muscles and helps to remove unneeded waste. For most people, proper exercise is the simple answer to ensuring they have good blood flow to both their bodies and their brains. Not only do we get a boost in oxygen to our muscles when exercising, but proper exercise releases our “feel good” endorphin’s (our natural pain-killers) so we experience an over-all sense of well-being and moments of euphoria – a sweet little bonus. There are a variety of exercises that can be used to increase blood flow, boost oxygen and remove waste. Stretching exercises are the perfect place to start and the perfect way to start your day – especially for anyone who presently struggles with strenuous activity. But, struggle or not, stretching is good for everyone. It pushes the blood and life-force throughout the circulatory system and is something everyone should be doing to some degree. When stretching, begin slowly and only increase the speed of your stretching movements as you get used to them. Once you are, speed them up to increase your heart rate but keep your movement’s fluid to avoid hurting yourself by pulling a muscle. Go for a walk. Walking is good for everyone and there’s no replacing fresh air when it comes to getting healthy. If possible take a nice long walk outside. It increases the oxygen, glucose and blood circulation to your body and brain and is great for increasing memory retention. Jogging rather than walking will increase blood flow to the lungs, muscles and brain even more efficiently while giving you the added benefits of a toned body. Yoga – all types of yoga – it’s all good. Find what fits you. Strength training/resistance exercises are, not surprising the ideal exercise. Studies reveal that resistance exercise (bench presses, lunges, squats, etc.) provide an even greater increase in circulation throughout the body than aerobic type exercises so yet another great reason to make strength training part of your routine. Added benefit: Regular exercise improves the blood flow in the small vessels that surround the heart so you’ll not only be improving your over-all health and fitness but you’ll be strengthening your heart at the same time. Tap into the power of your diet to help improve circulation by eating more super-foods – those that contain “good fats,” and provide us with antioxidant power and inflammatory properties. Spinach, avocados, oranges, cayenne pepper, Chia and Flax Seeds, garlic, super nuts, and the variety of power berries such as black berries are all known to help circulation along, and that’s just the short list. Give your blood a workout. Once you “get going,” your circulatory system “gets going” to keep up with you.